Such a sweet little card, Lucy! Congrats on your publishing success...you totally deserve the recognition! Totally lovely card. I like to see your name in magazine's. It's a beauty. Really my style. Oh so sweet Lucy. Love it. TFS and hope you are feeling better today. Such a sweet beautiful card! Love it! Congratulations Lucy on being published. Can I ask you another question, how do you get your copies of the American card magazines in England? I love all of your cards. Today you have made a simple beautiful one! Congrats on your 'publishing news'. Such a sweet card Lucy! Your cards always cheer me up! ;) Congrats on all the publications. You are becoming such a BIG talent! Totally adorable! Love the paper pieced bird and colour combo you used. How sweet is this?!?! Awesome card! As always you make the cutest cards ever. You actually make me think about trying digital cards. Thank you for sharing! I love your cards Lucy and it is so nice to see that you are receiving the recognition for your abilities. Thanks for the tip and keep your chin up! Hugs! Adorably sweet! I know you'll be published for many more years to come--love your style! Oh, this is so cute! 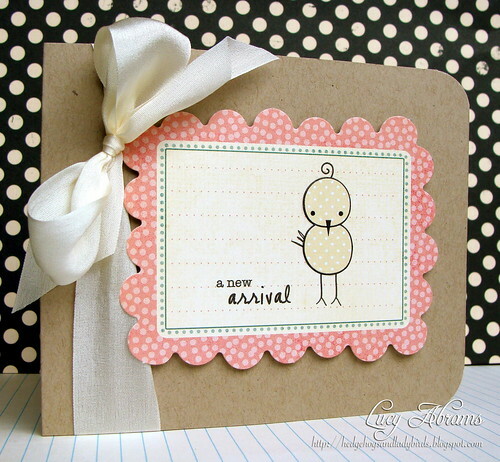 Love that image and perfect card you made with it!